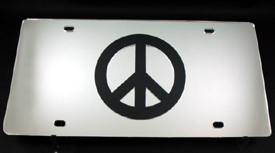 These license plates are made from acrylic and feature glossy black, mirrored silver or mirrored pink surfaces. 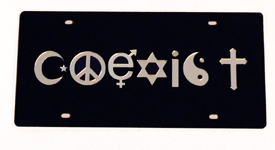 Each plate is laser cut and the peace and coexist symbols are hand inlaid, crafted to last for years. 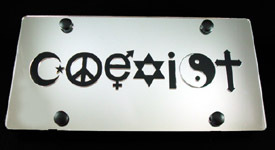 All plates are 12" x 6" (30.4 cm x 15.2 cm) - bolts are not included. Copyright © 2016 The Peace Channel Network, Inc. All rights reserved.